People born specifically on the 6th of March are believed to be free spirited non conformists with the usual Piscean warm heart and sympathetic nature. This particular day's ruling astrological planet is Venus making your temperament naturally refined, creative, home loving and sociable. If you have this birthday your slightly rebellious, independent streak will generally conform to rules but likes to do things differently. You are an excellent communicator who is easygoing, friendly, intuitive and someone that adores the company of others. Your overly high expectations in life may sometimes disappoint but it does not stop you from usually looking on the bright side. Individuals with a March the sixth birthday are fair minded, sensitively responsive to feelings and able to see points of view aside from their own. These characteristics allow you to ordinarily be an effective mediator who finds it easy to create and maintain harmonious relationships. The most attractive career options to a person born on the sixth of March are those that let you utilize your high levels of versatility and perceptiveness. You believe that working should give you a sense of purpose and satisfaction as well as financial rewards. You are likely to work freely for a worthwhile cause that has objectives that you agree with and want to support. A person with this particular birth date will be careful with their finances and are more often than not proficient at saving. Self employment is often a choice you may consider if you are capable of funding it yourself. For a Pisces, the person born on the sixth day of March is quite typical in their placement of a loving partnership as a top personal priority. Although you are nonjudgmental you can also be a bit of a perfectionist concerning the choosing of a partner. Your fantasy of the perfect soul mate is as a rule far too idealistic but if forms the basis for preferred requirements. The single life is not a position that you feel comfortable in, it makes you restless and feeling incomplete. You search for an emotional connection in addition to a physical attraction in someone special to love. as one without the other will not satisfy your ideals. In a long term personal relationship you are at your happiest and tend to give your all and avoid disagreements. Your agreeability in these circumstances can sometimes be taken advantage of if you do not learn to moderate it. Any health problems experienced by those born on March 6th are typically short lived due to your admirable attitude towards keeping healthy. You are not a fitness fanatic or a calorie counter but you do take healthiness fairly seriously. You will try your best to eat the right things, take regular exercise and enough rest. A vulnerability to get easily stressed could bother people born on this day and its quick recognition and banishment is often important for overall well being. Your appreciation of art, music and literary works is one way that you can help yourself to relax. Your main strengths of character are to be found in your attentive devotion to everything and everyone around you. An open mind and lots of fairness and sensitivity accompany this dedication and make you a real people person. Such positive fortes are rarely overshadowed by personality weaknesses for those born on March 6th. Your character's negative aspects include the tendencies to occasionally act a little complacent or suffer from a lack of direction. Both these traits are prone to surface if you become too absorbed in something or somebody and forget your usual thoughtful focused perspective. 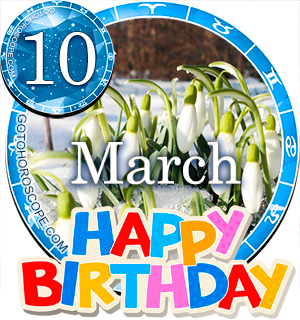 Being born on the 6th of March means that you like to do things using your finely tuned intuition, receptive intelligence and own methods. You are also not normally afraid of taking chances or adverse to trying out new things. This impacts on your goal setting and encourages you to put plenty of optimism into achieving life aims. When a challenge is presented to you it will be embraced as an opportunity to increase your knowledge or better yourself in some way. When you are not conjuring up scenarios of idyllic relationships your dreams are often filled with fond memories of good times. As you were born on the sixth day of the month this gives you a Root number score of Six attached to your birthday. This numerical reference has the keyword 'Social' and explains your eagerness to communicate and team up with others. In Tarot symbolism the 6th Major Arcana card, the Lovers, is indicated as most closely associated with your birthday. It reflects your romantic sentimentality and admiration of artistic expression. The luckiest gemstone for March the sixth birthdays is imagined to be Turquoise. It's luck and positivity is thought to generate serenity and wealth to those wearing it close. Astrologically speaking the planet Neptune is identified as the most powerful influence that determines Piscean star sign personalities. The actual day you were born on, the sixth of March is cosmically governed by the planet Venus helping influence some of your unique traits and ways of thinking. Your impartiality and mediating skills are two of your strongest points along with your versatile independence. These qualities set you apart in your zodiac group making you more straightforward and less emotionally clingy. They help you direct your discernment in the best ways to make steady progress. Conquering your proneness to get preoccupied or sidetracked easily could speed up your acquisition of professional success and personal happiness. A summarizing thought for people born on March the 6th is that saying No more often will benefit you as it can reduce your susceptibility to stress. This is facts. I'm going to spark this year and it feels great. Born on this very day in 1966 so so lucky that I have 030(666) as my birthday. Really puts an interesting spin on things. 6th march borner aree always beteerrr, also i ammm.. This doesn't sound like me. My health is in rough shape and my finances are not much better. I worry about both and wonder if I'll have enough to live on when I retire and will I live long enough to see my grandchildren get married. me also bore at 6 march. Don't forget to check your moon sign! Either way, its true he's a people pleaser and avoids disagreement. Pretty accurate, actually. suffer from a lack of direction. yes, i do right now. Why can I not get my planet on here!